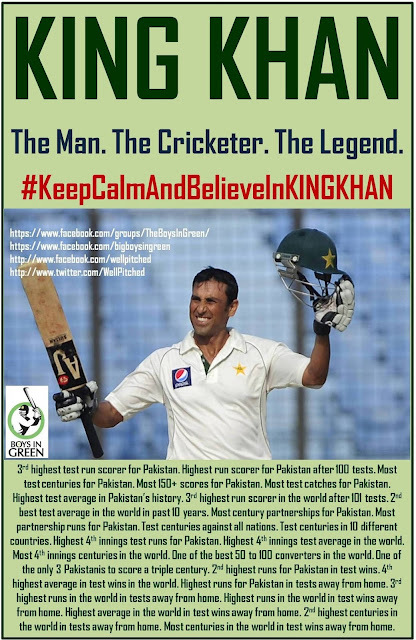 There is no doubt in my mind that Younis Khan is the greatest test cricketer ever produced by Pakistan. There are very few Pakistan test records that he does not own. Those that don't belong to him, will be his very soon. He holds a few world records as well, and with the way he is going, he will make some more for sure. The 37-year-old's achievements are truly magnified if one considers the fact that Younis has only played 101 Tests. The number came as a shock to Michael Clarke when Pakistan and Australia squared off in UAE last year. “Younis is a very good player and has been for a long time. I found out yesterday this is only his 93rd Test match, I thought he'd played a lot more than that. He's one of the gentlemen of our game, a class player,” Clarke had said. By Younis' own admission though, “in life you are constantly proving yourself” and there maybe a few more corners the Pakistan great turns. 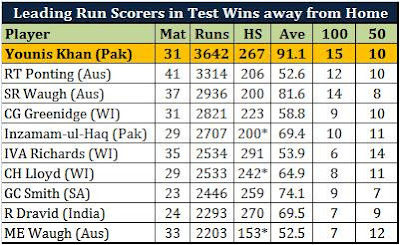 Younis Khan already has more test centuries than any other batsman from Pakistan; and 5 more than the next best tally of 25 by Inzamam. He is only 18 runs away from becoming the leading run scorer for Pakistan in test cricket; a record that has been held by Javed Miandad for over 2 decades. 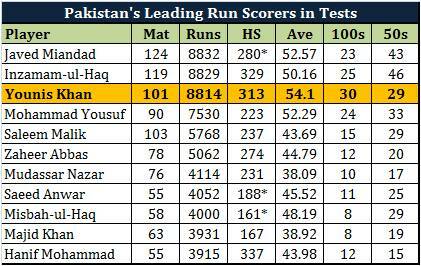 Younis is currently third on the list in terms of runs, but in terms of average he is well above the rest. His unbeaten 171 that led Pakistan to a historic victory over Sri Lanka was Younis' 11th score of 150 or more, which is the highest number of 150+ scores for Pakistan in their history. He went past Javed Miandad who has 10 scores of 150 or more for Pakistan. While Miandad's 10 innings include 6 double centuries, Younis' innings comprise 5 double centuries and 1 triple century. He is one of the only three Pakistani batsmen who have scored a triple century. Younis is among the 10 highest run scorers in test cricket in the past 10 years. 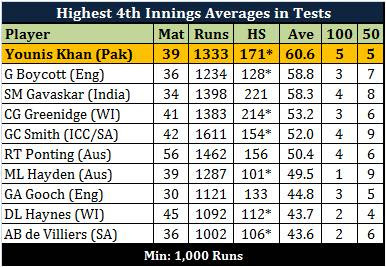 It is no surprise that he has played the least amount of tests among these 10 batsmen; significantly less at that. 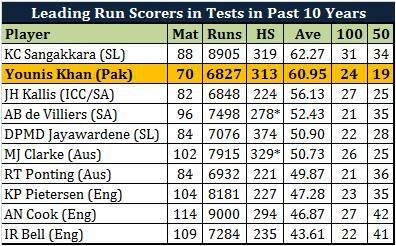 Among these 10 batsmen, Younis is one of the only two who average over 60; Sangakkara is the other one. Yes, he has been better than KP, Cook, Ponting, Clarke, Kallis, and AB De Villiers in the past 10 years! Talk about being under rated! Not only has Younis been better than his contemporaries, he has also been better than the popularly mentioned modern day great test batsmen. 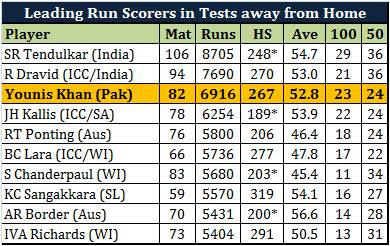 Here's a look at where the top 6 leading run scorers in test cricket were after 101 tests. It is so unfortunate that Younis has played only 101 tests in his 15 year career so far. Younis has more runs than Dravid, Sachin, Ponting, and Kallis did; the same number of centuries as Sachin did; he is the only one along with Lara to have scored a triple hundred; and he has the best 50 to 100 conversion ratio among all of them. And then all the names we hear are Sachin, Ponting. Kallis, Lara... Can you imagine where Younis would be if he played as much test cricket as these batsmen? Inzamam Ul Haq is the biggest match winner produced by Pakistan. His 4,690 runs at an average of 78 with 17 centuries in test match wins is unparalleled in Pakistan's test history. Younis Khan is not far behind and will probably end up a bigger match winner than Inzamam before his career ends. In terms of averages among all batsmen that have scored at least 1,500 runs in test match wins for their countries, Younis Khan is right up there; behind only Sir Don Bradman, Inzamam, and Sir Gary Sobers. Everyone scores runs at home. Well almost everyone. A true test of a batsman comes when he plays in unfamiliar conditions away from home. In the history of test cricket, only Sachin and Dravid have scored more runs, and only Sachin has scored more centuries, than Younis has in tests away from home. 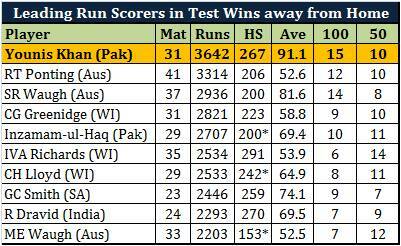 Furthermore, Younis Khan is the leading run scorer in the history of test cricket in test match wins away from home. He also has the most number of centuries in test wins away from home with his unbeaten 171 taking him past Steve Waugh's 14. 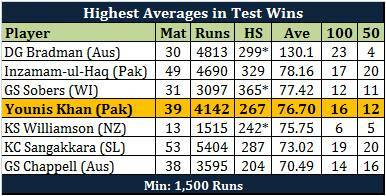 And no one even comes close to him in terms of average in test wins away from home. The 4th innings of a test match is the most difficult time to bat. The pitch has deteriorated, players have been in and out of the field for 3-4 days, and the pressure is at its peak considering that the batsmen are out there to either chase a target or save a match. 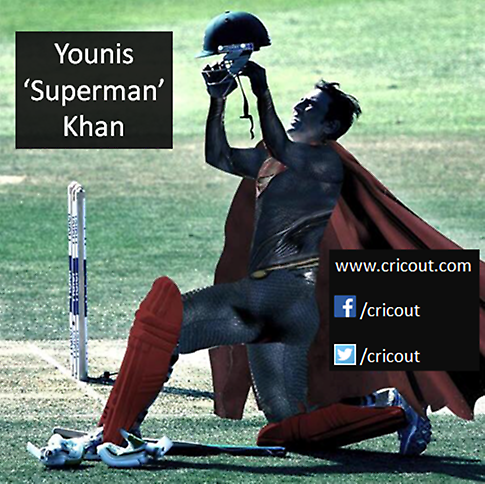 When it comes to performing in such situations, there is no one who is better at it than Younis Khan. He is the absolute king and by far the best batsman in the history of test cricket in the 4th innings. Younis has scored 5 centuries in the 4th innings of tests, more than anyone else in the world. His 4th innings average among all batsmen who have scored at least 1,000 runs in the 4th innings is the highest in the world. He is the only batsman to average over 60 in the 4th innings in the history of test cricket. Furthermore, Younis Khan's match winning unbeaten 171 against Sri Lanka beat his own personal 4th innings best of 131* and also created a new record for the highest score by a Pakistan batsman in the 4th innings; beating Saleem Malik's 155, which he also scored against Sri Lanka in 1997. His 171* is also the 4th highest score ever in the 4th innings of a test in a successful chase, behind Greenidge's 214*, Morris' 182, and Bradman's and Butcher's 173*. Partnerships are the key to batting in international cricket. They help build strong totals, they help set targets, and they help chase down targets. And Younis Khan is the absolute king of partnerships for Pakistan. He has now been involved in 61 century partnerships for Pakistan, which is the highest number for anyone from Pakistan. He has added 3,137 runs at an average of 78.42 with Mohammad Yousuf, which is the most partnership runs by any Pakistan pair in tests. He has 13 century partnerships with Misbah Ul Haq, which is the most for any Pakistan pair. He also has 9 century partnerships with Mohammad Yousuf. 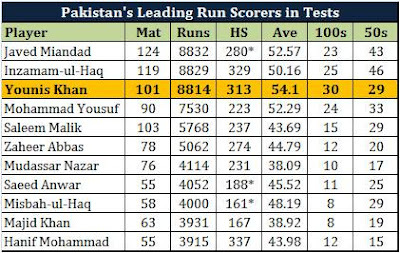 Something that will never be captured by statistics is Younis Khan's impact on Pakistan's batting line up in terms of guiding younger batsmen. Fawad Alam, Azhar Ali, Asad Shafiq, and now Shan Masood have Younis Khan to thank for reaching their maiden test hundreds. Each one of those batsmen reached their maiden test century while involved in a 100 run partnership with Younis Khan. His 242 run partnership with Shan that set up victory for Pakistan has created records and that was not Younis Khan's first 200 run partnership with a young batsmen while guiding him towards his maiden century - he also put on 200 runs with Fawad Alam and 259 runs with Asad Shafiq. This is the impact that Younis Khan has had on Pakistan's batsmen. Not only the younger ones, but even stalwarts like Yousuf, Inzamam, and Misbah have reached many of their test centuries with Younis at the other end. He is the absolute king of test cricket for Pakistan and undoubtedly one of the best to ever play the game. Younis is no doubt one of the greatest test players,he is among the legends in test cricket. Still, he is not in the League of Sachin, Ponting, Kallis because they were outstanding in ALL FORMATS OF THE GAME, even he can't be compare with Miandad, Inzi, Yousaf because they have won many ODIs as well for Pakistan. He is pathetic as an ODI No. 3 and he failed miserably in the CWC 2015. He got himself selected after pressurizing PCB on media to select him on the basis of his performance in test series against Australia. Even Azhar Ali would have been a better choice if PCB was seeing him as a future captain. Younis should come out of fool's paradise and retire from ODIs immediately.